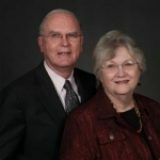 Ken and Gayle moved to Dayton in 1998 from the Champions Area of Spring where they were members of the Bammel Rd Church. Ken served as a Deacon at Bammel and is now an Elder at Liberty. Ken was previously in sales and is now owner of Arrow Realty. Gayle taught business, English, and math and is currently a quilt designer and instructor.